Different applications may sometimes need to "communicate" with each other, or exchange information. Such applications may live on the same "machine", or they may be installed on different machines. of business functionality. They themselves, are often not involved in interfacing and lower level protocols. addressing, assembling segments, error correction, media-acces etc... is taken care of by such a "network-stack". So, the the bottom layers are handled then, by the network stack. However, maybe App1 on Machine1, wants to activate, or call, a certain procedure of App2 on Machine2. wraps it up and passes it to the local transport/network layer in order that it will reach App2 on the other machine. this IPC mechanism (like a named pipe) wraps it, and passes it to the transport/network layer. an "Inter Process Communication" (IPC) protocol or mechanism. 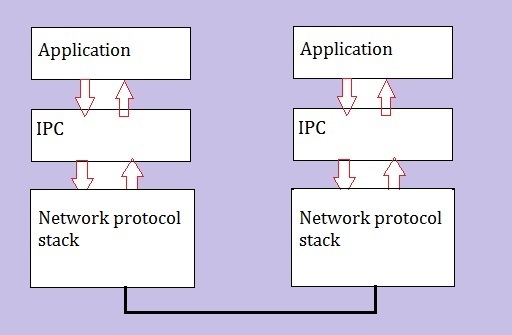 Figure 1: High-level overview "Application-IPC-Network" stack. Applications (or distributed modules of those app's) may communicate using a variety of IPC's. Some well-known IPC's are "RPC", "shared memory", "named pipes", "sockets", and a couple more of such IPC's. which is quite similar to RPC. In another note, I like to go into some main Java specific IPC mechanisms. For communication between applications, in principle, only one IPC mechanism should suffice. But for various functions, it's possible that other IPC mechanisms are "called in" too. to use multiple IPC methods. By the way, no picture showing IPC's, can be perfect: it will never make everybody happy. -Remember that, in principle, an Application should use one IPC method to communicate with another remote Application. -However, sometimes, for various functions, often multiple IPC's are selected. -And it is also true that a certain IPC, may use the exposed "methods" of another IPC, for certain functionality. You may also wonder how providers/libraries as ODBC and OLEDB etc.. would fit in such a picture as shown in figure 2. These providers are pretty much "high-level", and the appendices will show some common examples. Maybe it's not a bad idea to discuss a few of those IPC's. This one is often used in situations where two processes are on different machines. The "conceptual" idea is easy to visualize: picture a client process and a serverprocess. Next, visualize a "tube" between those processes, which they use to exchange information. two "modes" of usage could be distinguished: "byte mode" and "message mode". to the other (ofcourse, with buffering when needed). It really looks like a unix pipe, where the output from one program is fed into a second program. Pipes or "named pipes" (if they really have a identifier as a "name"), absolutely looks like filesystem IO. In fact, when a pipe is instantiated, a "handle" is declared and bound to the pipe. As you might know, "handles" are the mechanism by which a file is accessed. to send and receive data. You might see it as an (OSI) session layer protocol (layer 5), and it just uses the services of an underlying network protocol. Yes indeed. Named pipes can just float on almost any networkprotocol. enhances the view that it simply resembles filesystem IO. or, if you have some server process on your system which uses named pipes, you can find a name like "\\.\pipe\pipename"
on your system, for example in the Registry (note: "\\." is a synonym for the local system). Some applications use "shared memory" for exchange of information. It is true that some architects and developers do not view it as a true IPC mechanism. A characteristic however, is that the applications reside on the same system and Operating system. While other IPC's more often use networks or remote communications, the "shared memory" works local. I immediately haste myself to say that indeed "distributed" memories across systems do exist. But in the mainstream of commodity applications, the use of shared memory is a local business (local to the machine). of the shared memory. This way, exchange of information can be realized (e.g. rows of some table). The systemcall interface (or API) of the OS, usually provides functions to reserve and release "shared memory". Typically, once in place, the processes can read and write in those memory segments without calling operating system functions. This is neccessary, while otherwise "access violations" by the OS would be signalled al the time. and strange things will happen. Often (but not exclusively) "mutexes" will handle the synchronizations. the same resource, but not simultaneously. and "latches" (whereby the latter is a general term for locks on resource objects). "domain sockets" and "network sockets". A "domain socket" is an IPC method by which processes, usually on the same host, can communicate. Such a socket again looks like a sort of filesystem IO, and is known by a pathname. So, a "pipe" and a domain socket on a unix/linux system, have quite a few similarities tin common. is then identified by an IP address and port. These sockets can be used with local- and remote communications. When talking about IPC in networks, usually, folks mean TCP- or "network sockets". So, here I only like to say a few words on network-, or TCP sockets. The figure above, shows three parts. Please take notic of the middle picture. Here we see the IP header and TCP header of an IP packet in a Local Aera Network. The IP header is mainly occupied with "addressing" business (source- and destination IP address). Now look at the TCP header. Here we see the source- and destination ports as fields in that header. it would then be the "destination port" (like for example 1521). In fact, the string "IP address:Port" completely identifies a service on a remote machine. using the IP address 202.100.100.43, where that service "listens" for connections to port "1521". Usually, server services use fixed ports (where they listen on), like for example 1521.
is not already occupied by some other client process (on some specific client machine). the connection points between client- and server processes (usually on different machines). to the services which are listening on their own port. On some Operating systems (some unixes), such a process is indeed named (like something that looks) like "portmapper". But on most other platforms, you do not see something like that in a process listing. If you work with Windows, I can tell you that it "a lot of it, runs completely on RPC. If RPC is used between modules within the same Operating System (machine), then RPC is often renamed to LPC. LPC is short for "Local Procedure Call". want to have a remote program (that is, on another machine), to execute a "procedure". often called "methods" which we can associate with a (program) "object". If a developer creates a OOP "object", he/she also writes code like "member functions", which are defined within that object. Usually, public and private methods are written, where the public ones can be "called" by an external entity (like another object). -How does App1 "knows" which methods it can "call" from App2? -Secondly, how does App2 knows that it must execute that specific method (on request of App1)? This is all covered by the RPC protocol. It can also be a part of the "Interface Definition" (IDL), which makes it possible how App1 knows how to call "what" on App2. it can ask of App2. which the underlying IPC mechanism can understand, and the stream is handed over to for example the "sockets" interface. and the member function is executed by App2. Note: figure 4 was created with (D)COM applications in mind, which primarily uses RPC as a common IPC. There may exist different perceptions on this. However, the usual "Message Exchange" interpretation, is, generally, not the same as "Message Passing". But I must say that the boundary is not always very clear, and indeed, sometime "Exchange" works like "Passing". to place an order, or a request for stock information, or data that must be stored at the receiver etc..
exist at both the sender and receiver, and data messages get transferred when needed. When the receiver is temporarily unavailble, the messages will stay in the queue, until they can be processed. This is really an IPC mechanism. Most Operating Systems and applications make use of it. 1. "Events" and nummeric identifiers on/in the same Operating System, and Applications. In Windows applications, it is heavily used, especially in graphical applications (thus practically all). In the Windows example, a "message" is simply a numeric code that uniquely corresponds to a particular event. So, Message Passing in "Event-driven" applications (on the same system) is very common. Especially traditional programmers on the Win32 API, can probably just list many of them without consulting any documentation. 2. Calling "methods" (functions) of local or remote objects. You might say that this looks like "RPC". Yes, but generally, the request is encapsulated in a "message". it can also be used to request a remote service to execute a procedure. in that message will simply lead to the fact that the procedure is executed. send() and receive() functions can be used, with the objective to activate code on a local or even remote object. The "formal" MPI specification, is quite an elaborate framework. I think that the descriptions as listed in (1) and (2), are the most common Message Passing models. the infrastructure simply demands it, then (3) is used. For (2) and (3), often TCP sockets are used as the lower level IPC. So, I guess that this is about it, for what I like to say on some standard IPC mechanisms. Some platforms have some specific IPC mechanisms. It's indeed interesting to explore the "Java world"
with respect to IPC. I like to do that in another note. IPC and the traditional SQL client connectivity.